On the highest part of the city of Baku, Azerbaijan�s vibrant capital city, lies one of the most extra-ordinary and audacious buildings of modern times. Known as the Flame Towers and the tallest building complex in Azerbaijan, the building�s three columns are an apt symbol for this "land of fire". 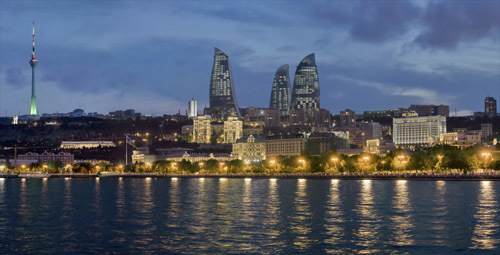 Changing the city�s skyline forever, the iconic Flame Towers mixed-use complex acts as a beacon to the future for this ancient country; its flames epitomising the comfort, warmth and genuine welcome that are a by-word for legendary Azerbaijani hospitality and reflect the country�s re-emergence onto the global scene. The 36-storey Fairmont Baku, Flame Towers is situated on the northern corner of the site and features 318 rooms, suites and apartments, over 2500 sqm of multi-use meeting space, a 3500sqm spa facility - ESPA, located over two floors and several restaurants, bars and lounges. With breathtaking views over Baku, the Caspian Sea and the UNESCO World Heritage site of the ancient inner city, Fairmont Baku Flame Towers has swiftly become the place to stay and to be seen.